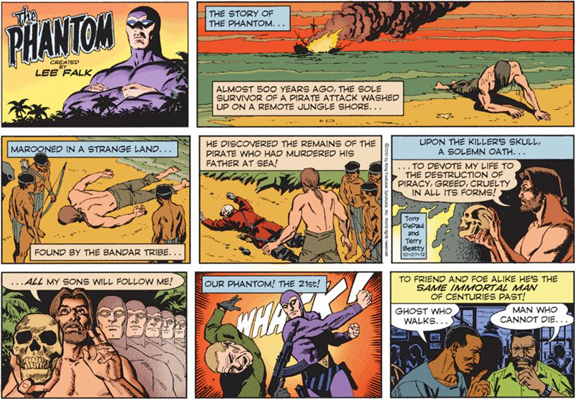 “For those who came in late…” – and with those words, Lee Falk, creator and author of The Phantom, would introduce to readers, both old and new, the legend of the hero known to many as “The Ghost Who Walks – Man Who Cannot Die”. The Phantom we read about today is, in fact, the 21st descendant of an English nobleman, Sir Christopher Standish who, in 1525, swore an oath of vengeance on the skull of his father’s murderer, ‘against all piracy, greed and cruelty’, and pledged that ‘as long as my descendants walk the earth, the eldest male of the family shall carry out my work’. And so began the unbroken dynasty of crime-fighters known as The Phantom, who have fought piracy and tyranny for over 400 years. The present-day Phantom’s real name is Kit Walker – the family’s ancestral name, coined in honour of the legend, ‘The Ghost Who Walks’. Clad in a purple costume, his face concealed by a cowl and mask, The Phantom’s true identity – and the secret of his family dynasty – is known only to a trusted few, among them the Bandar tribe’s medicine man, Guran; the Phantom’s wife, Diana Palmer; and their two children, the twins Kit and Heloise. The Phantom presides over a hidden stretch of African jungle, known as the Deep Woods, home to the mysterious Bandar pygmy tribe, whose lethal poison arrows are feared by all. He resides in the eerie Skull Cave, which houses the crypts of his ancestors, along with the ‘Phantom Chronicles’, a library containing the hand-written accounts of his forefathers’ adventurous exploits. Although armed with two Colt. 45 automatic pistols, The Phantom rarely shoots to kill, preferring to use his expert marksmanship to wound or disarm his opponents (He also carries a concealed knife in his boot, which has allowed him to escape from many a life-threatening trap). The Phantom’s principal weapon is his granite-hard right fist, on which he wears the famous ‘Skull Ring’, which leaves a permanent skull-mark on the jaw of any criminal foolish enough to challenge him to a fight. On his left hand, he wears the ‘Good Mark’ ring (comprised of four intersecting swords, with their hilts facing outwards); anyone who receives this mark (gently applied to the inside of their wrist) will receive aid and protection from The Phantom, no matter where they are, for the rest of their life. Accompanying The Phantom on his jungle adventures are his loyal stallion, Hero, and his canine companion, Devil – a wolf who is forever being mistaken for a mere dog by criminals, until his ferocious bite convinces them otherwise!